One of our latest developments is a compact, adjustable edit station for agile workers. The desk is made of a black paper compound and can rise, fall and swivel to give the user ultimate flexibility. All connectivity is hidden behind a curved modesty panel and bright, industrial yellow wheels allow it to be moved across the office floor. Here is one example of a range of tables recently manufactured for a private equity firm, all of which required a variety of specialist techniques. The surf edge detail is coated in a patinated liquid bronze finish, post-lipped to surround the leather top and decorative bronze inlay. The base is constructed from solid European walnut in a tapered cross formation, with cables running down the inside of each leg. The tables were accompanied by a 3.6m long patinated bronze and leather fronted reception desk. Opus Magnum recently worked with Kurt Geiger on a new shop display by manufacturing and installing these leaf-like, rotating shoe shelves. Each shelf is individually cast in Jesmonite and features an integrated LED to illuminate the shelf below, all cantilevered off a single powder-coated aluminium pole. There are close to 100 of these shelves in the space creating an organic, adaptable, footwear forest. Opus Magnum is currently producing an impressive 12m long boardroom table in grey-stained, quarter sawn, European oak. The top includes a black Fenix inlay with 16 matching flaps to house retractable data monitors and microphones. The large base is clad entirely in Fenix with flush access doors for cable management. A table this long is always a welcome challenge! Pictures to follow upon completion. To aid in the selection of two Onyx slabs for a current project in the Heron Tower, a day trip to northern Italy was required. These slabs were hand-picked fresh from the source and will be water-jet cut to lie in the centre of an impressive, 8m long, corporate dining table. The waves have taken shape! Opus Magnum manufactured and installed this stunning reception area, clad almost entirely with concrete. 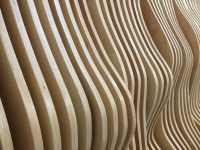 The contrasting birch plywood feature wall was CNC’d from individual panels, each with a unique angled edge to accentuate the form. 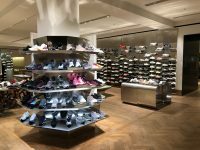 Opus Magnum‘s most recent installation for Selfridges – a vapour blasted, stainless steel sneaker gallery consisting of folded display walls, mid-floor tables, faceted column shelving and bevelled brand signage. The soft reflections achieved by vapour blasting are stunning.